Start from registering your Domain Name! ◉ It's a best ever deal to own a modern looking responsive website for your organization. ◉ Give your business a more professional identity. Can use your website & email addresses in your business card. ◉ No hidden charges. 1st Year's fee INR 2699/- only and Renewal amount is fixed at INR 2699/- yearly. ◉ No DIY Automated website Builder Application. Our developer will develop website for you. ◉ 3 to 4 Working Days of Turn Around time, in which complete site will be ready & delivered. ◉ Industry standard client management & support system. You can access our video tutorials here. ◉ The deal includes full one year hosting service without further site restriction. ◉ In future if you want to edit your website yourself then you can do this via your webhost control panel, accessing file manager. ◉ New Domain Booking or Transfer of Your Existing Domain for 1 year is allowed. ◉ New Hosting Account Creation or Transfer of Existing CPanel Account for 1 year. For CPANEL transfer, please read this article. ◉ Hosting Include: Unlimited Hosting Space, Unlimited Bandwidth, Unlimited FTP & Databases & many more. ◉ Unlimited Business Email ID's are allowed. Here are tutorial to access email ID's via Webmail or Email Client or Mobile Client. ◉ Creation of Complete 5 page Device friendly & responsive static website for your business. ◉ Unique site template for your website. For looks and feel selection, around 800+ designs to choose from. ◉ One slider in Home Page (Selected template must contain slider). HD picture quality for site images. ◉ We update you once website is ready. Once you are happy with this plan, can place order via calling one of the following number (+91-9163456258 / +91-33-4006-1863) or sending email to (care@ingeniouswebsitesolution.com) with your requirment details or Placing order online via Typing domain name from above text feild. Here are the detailed ordering steps, you must follow for easier ordering process. STEP 1 (Domain Lookup): Before placing an order it is very important to check the domain whether it is available for booking or not. So you need to do a who is lookup. Please perform a who-is lookup here. Note: If you are planning to transfer domain from another registrar. Then please request them for EPP code. We have listed few tutorial for following domain registrar. Enom.com, Godaddy.com, Yahoo.com, Networsolutions.com, Register.com, Dotstet.com, Namecheap.com. So please follow one of the tutorial, which fits best for you. If your domain registrar is other from these then pease follow their suggestion. STEP 2 (Creating Billing Account): You need to provide following details. These information will help us in creating your billing & project management account with us. 1. Turn off the domain lock & privacy protection if it is activated on your loosing registrar. 2. Grab the Correct EPP code & inform us. 3. Approve the Domain Transfer confirmation email which you will receive from our company. STEP 3 (Deciding the List Of Addons You Need): If you are unable to manage content, then we shall manage your content against a very minimal rate. You need to inform the list of extra addons which you want to add with this plan. Following list of addons are available for you. Based on your requirment, we will add them on invoice. STEP 4 (Invoice Generation): Our billing admin will generate invoice based your order details & noyify in your Registered Email Id. STEP 5 (Making Payment): To get started with site development task, you need to pay invoice earliest your possiblity. Please note that no part payment is allowed for this plan. You can pay fees in any one of the following methods. 1. Via Bank Transfer: Please use Our Bank detail for sending funds Online (Net Banking) / Via Bank Cash Deposit / Check Depost. 1. Via International Wire Transfer: Please use Our Bank detail for sending funds Via International Wire Transfer. It's safe & easy. Note: Via wire transfer our company will receive exact fund in our Bank account. Your payment will attaract 11.95% of Service charge. So you must prepay them from your end. 2. Pay Online From Our Website: You can directly pay development fee online from our website. For online payment, at first you need to create an account with us. For creating an account please follow this link. Once your account is created & verified by our administrator, we will generate invoice on your account & sent you a system generated email. To make payment online, you need to follow our system generated email & embedded links on it. Please note that the online payment will attaract 10% of Gateway fee + 11.95% of Service charge. STEP 6 (Sending Transaction Details): Once you have successfully made the payment, please get back to us via email at (care@ingeniouswebsitesolution.com) with "Transaction Details" which states that payment was successfully processed. After your intimation, our billing admin will manually update your payment on your account & sent you the receipt. STEP 7 (Granting Access For Template Gallery): Soon after payment authorization, we will grant access to respective template gallery. For that our admin will sent system email having our template gallery login credential. 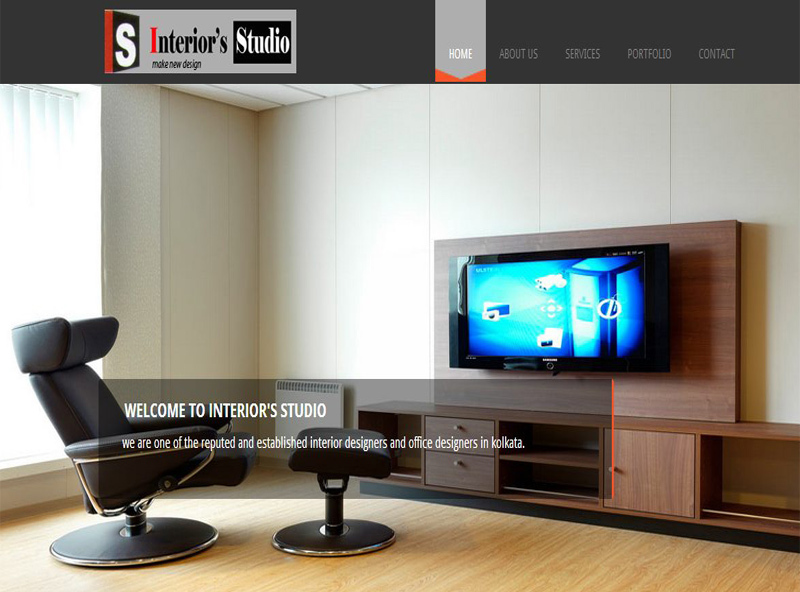 You need to select appropriate template for your upcoming website. So we are advising you to must select any one template from our template gallery and must inform us the "Template Number", so that our people can start working on your project. Outside template are not allowed in this package. ◉ Please take your time & preview all designs. Once you are decided with any one design just revert back to us with exact Template Number. You can choose 2 to 3 designs parallely but you need to prioritize your option so that on the moment of site development our people can have your options to choose from. Your turnaround is important. ◉ Any two templates, their features & styles can't be merged together. ◉ All the template links are for demonstration purpose only. So visit those links minutely, because your upcoming website will have around similar looks and feels. ◉ On the moment of template review, Please more concentrate on Top menu style (Drop-down etc), Header style, footer style and others if you feel some good. ◉ You can use Google chrome browser for visiting template gallery. Upon visiting the gallery, you will be prompted to input username and password. Please use desired login info. Please preview each & every designs. Once you are happy with selection then please let us know your final choice with the information like:: "the template Number" & "Live link for that Template". STEP 8 (Booking Of Services): Soon after payment authorization, our admin will book your desired Domain & Hosting Account for same & sent system email having login credential of your webhost account & intimation about domain is booked. Please save that email for future use. Please take a note that untill the website is not developed & delivered it is advised to you to not change your webhost login credentials. STEP 9 (Creating Email Account For Your Business): Please note that Unlimited business email id's are allowed in this plan. If you want to create email id's like: info@yourdomain.com etc... Then please follow this video tutorial. STEP 10 (Sending Contents for Site Development): Please Follow The Below Steps Before Sending Content. ◉ 1: First you will decide about pages and their menu name will have in your website. ◉ 2: Now fill the content details in an Word Document with the page / menu's name on the heading (If possible make separate word file for separate pages). ◉ 3: Go through the main template which you selected and decide which layout of the template you want us to make your inner pages (i.e. except Homepage and Contact Us Page). ◉ 4: Decide about the image as per your requirement and choice (if possible rename the image with your preferable placeholder. e.g.- home.jpg, about-us.jpg, etc...). ◉ 5: After everything gets ready copy all the files inside a particular folder, then ZIP that folder and attach us in e-mail (care@ingeniouswebsitesolution.com). STEP 12 (Deploying The Developed Website In Server Root): After site dvelopment is complete & approved by you, we will deploy the developed website in server root & complete the deal. For any final moment changes you can inform us with your detailed suggestion with the help of screenshot in (care@ingeniouswebsitesolution.com). Our developer will do that & update your website. Please note that in this plan only one round of changes are free. STEP 13 (Site Maintenance Scopes - You May Need In Future): After site dvelopment is complete, you may need our support in future. The website maintenance is essential for keeping your site fresh, appealing and up to date. ◉ OPTION 1 (PAY PER INCIDENCE): You can pay as you need. This may include creation of new page / page revision / news update etc... Each incidence include 4 hours of work & will cost INR 900/- only. Same day delivery. ◉ OPTION 2 (Monthly Subscription): You can subscribe monthly plan. This may include creation of new page / page revision / news update etc... Each incidence include 4 hours of work & only two free incidences are allowed in a month. Will cost INR 1200/- only. Same day delivery. ◉ OPTION 3 (Yearly Subscription): You can subscribe yearly plan. This may include creation of new page / page revision / news update etc... Each incidence include 4 hours of work & 15 free incidences are allowed in a year. Will cost INR 12000/- only. Additional 10% discount in total amount, if paid in advance. Same day delivery. ◉ Forms like Contact form, Feedback form etc... are not available with this plan. You can have it @ INR 500 per form. ◉ Only 5 sitepages are free with this plan, If you want any additional site pages then it will cost you INR 300/- per page. ◉ On the moment of site development, only one round of iteration / Site Changes are free. From second & onward iteration it will cost INR 500/- per changes. Please note that iteration / Site Changes are in effect when our developer creates your site based on initial content provided by you. In developed design what ever the fissible changes you need, will fall under iteration / Site Changes. Cost of iteration / Site Changes may be higher than our defined if changes you requested is complex in nature or time taking one. ◉ For your site development, you need to provide Texts for all of your site pages. Unfortunately, If you have hard time on creating "Texts" for you your site, then on your request our expert copy writer can help you in creating content for your site pages. We will provide Standard Content writing only at INR 700/- per page for 400 words long article. ◉ For your site development, you need to provide "Images" for all of your site pages. Unfortunately, If you have hard time on sending "Images" for you your site, then on your request our developer can suggest "Stock Images" for your website. We provide Standard "Stock Images" only at INR 500/- per image. ◉ After placing order & making payment, our template gallery login details are automatically mailed in your registered email. You need to select appropriate template for your upcoming website. So we are advising you to must select any one template from our template gallery and must inform us the "Template Number", so that our people can start working on your project. Outside template from our gallery will be not allowed in this package. But if you want us to create customised website based on your suggestion then you need to pay template development cost upfront. The cost for templete development can only be analysed if we have your design suggestion. You can send your customised design suggestion in the email: "care@ingeniouswebsitesolution.com"
◉ If you want us to develop logo for your website then our creative people will happy to help you out. Development of High resolution Standard Business Logo for your organization will cost INR 1500/- only. We do graphic design work for all digital & printing purposes. Our expert creative people will help you in creation of digital screen print design, creative artwork design, logo design, product label design, flyer design, product mockup creation, banner design, leaflet / flyer design and many more. Due to the legal contract we can't publish every work in our website but if need more works for your review, just let us know. ◉ In future if you want to place any graphic design task to our company. Then at first you need to inform us. Based on available time slot we will arrange one appointment with our dedicated creative person. He will reach to your place based on fixed schedule. Once he reaches to your office, you need to discuss the creative topic with him. If possible need to forward all relevant information like... design sample (scan copy), suggestive logo, textual contents & pictures , print size & bleed area related information etc... so that he can understand the topic well. Please note that only one doorstep visit for creative work is free. Doorstep visit is only available for Kolkata based customers. ◉ Once information suggested in point 1 are with us, we will consult our creative head and promptly reply back to you with dead line date & pricing. Only three iterations are free in any creative development. ◉ Once information suggested in point 2 is complete & you agreed to place an order to our company. Then just let us know. After receiving your message our creative people will start working on your project. Once the project is ready we will attach the final files (which may be in Photoshop, AI format) to you. ◉ Once information suggested in point 3 are with you, just review the work & let us know your further suggestion or feedback. If you are happy with work just let us know we will close the project or if you need further changes then also let us know. We will forward your message to our creative team for further changes. Once the revised file will be ready we will send it to you. Now you again need to follow the same step with revised changes & follow this step entirely until you are not happy. ◉ Once information suggested in point 4 are complete, we will add fee for design works on your account & intimate you via email. You can pay fees via online bank transfer. Fee For Graphic Design Works: Our creative people work on a day (8 Hours) basis. Our Charges varies from INR 1000 to INR 6600 per day (Based on the project complexity). Most probably the logo design, label design, flyer design & screen print design are covered in a day only. But product mockup creation & leaflet / flyer development will may take 2 to 5 days based on the art work associated. Note: We wont work in hourly basis because it will not worth our clients. Also will cost them more. 1. Only 5 sitepages are free with this plan, If you want any additional site pages then it will cost you INR 300/- per page. 2. Forms like Contact form, Feedback form etc... are not available with this plan. You can have it @ INR 500 per form. 3. On the moment of site development, only one round of iteration / Site Changes are free. From second & onward iteration it will cost INR 500/- per changes. Please note that iteration / Site Changes are in effect when our developer creates your site based on initial content provided by you. In developed design what ever the fissible changes you need, will fall under iteration / Site Changes. Cost of iteration / Site Changes may be higher than our defined if changes you requested is complex in nature or time taking one. 4. For your site development, you need to provide Texts for all of your site pages. For more clarification regarding what and how to send content please refer to our 7th Tab in this page. The Tab is named as "How to send content". Unfortunately, If you have hard time on creating "Texts" for you your site, then on your request our expert copy writer can help you in creating content for your site pages. We will provide Standard Content writing only at INR 700/- per page for 400 words long article. 5. For your site development, you need to provide "Images" for all of your site pages. Unfortunately, If you have hard time on sending "Images" for your site, then on your request our developer can suggest "Stock Images" for your website. We provide Standard "Stock Images" only at INR 500/- per image. 6. For your site development, you need to provide "Logo" for your site pages. Unfortunately, If you have hard time on sending "Logo" for your site, then our creative people will happy to help you out. Development of High resolution Standard Business Logo for your organization will cost INR 1500/- only. 7. For this plan if order once placed & payment is successfully approved by our admin. Cannot be cancelled or refunded. 8. Whatever feature inclusions available in this plan are can't be altered or redeemed. Suppose if you are interested in this plan & don't want to book Domain or Hosting services or both of them. In replace of that you want to give further discount on our predefined plan, which is unfortunately not available. 9. On the moment of order booking, if you want us to create logo, write contents for webpages, want us to create additional sitepages etc... Then you must have to pay those fees in advance. No part payment is allowed for this plan. 10. Doorstep visiting is not allowed for this plan. However on additional payment of INR 500/- we can arrange doorstep visit for Kolkata based customers. You need to pay fee for doorstep visit in advance before making an appointment. You need to be very polite in front of our technical people (who will visit you). Any abuse or bad word will no way tolerated. Also on the moment of discussion you need to focus mainly on the topic for that you have reserved the appointment. 11. Once your website is up, ready & approved by you for launch. We will consider the deal as closed. In future if you need any support regarding maintaining the website, then you need to pay fee accordingly. Please see our "Site Maintenance" fee under Tab3 of this page. You can find the name of that tab as "Extra Addons". 12. For your site development, In any circumstances only one point of contact should be allowed from your end. You need to decide who will be your point of contact & need us to inform accordingly. This way we will make sure that site development is going in right direction. The developer who will work on your site can directly communicate with him for suggestion if he / she need any. 13. This plan can't be used to create any website related to Tech Support / Pc Support / Pronography / Adult product / Videography / Pharmacy business. In any point of incidence, if we know that you violating our rules or publishing details without our concern cab be a cause of immidiate account termination. No question will be asked. 14. In this plan, our people will only start working on your website, if the payment is successfully deposited in our account, Template related information & relevant contents for your website are available with us. Once every thing is with us then in maximum of two working days, your website will be live. For any final moment changes / delay in sending content / delay in progress tracking etc... can delay the project delivey deadline too. So your turnaround will be vital. Any blame on our developer is no where tolerated, if delay is from your end. To track progress on your website any time you visit this url www.yourdomainname.com/dev . Replace "yourdomainname.com" with your actual domain name. 15. In this plan, if you want us to implement any application or customized module which is out of scope of this plan can't be added as free. Customised module can be anything. It may be login / register section, may be blog anything. What exactly you need, you need inform us in detail. You can send your customised suggestion in the email: "care@ingeniouswebsitesolution.com". Based on your request our people will create quote & send it to you. If you are happy with our pricing then need to transfer fund to our account & our people will develop the applicate as you want. 16. Please note that on Saturday, Sunday & in all national & public Holidays we are closed for development. 17. After placing order & making payment, our template gallery login details are automatically mailed in your registered email. You need to select appropriate template for your upcoming website. So we are advising you to must select any one template from our template gallery and must inform us the "Template Number", so that our people can start working on your project. Outside template from our gallery will be not allowed in this package. But if you want us to create customised website based on your suggestion then you need to pay template development cost upfront. The cost for templete development can only be analysed if we have your design suggestion. You can send your customised design suggestion in the email: "care@ingeniouswebsitesolution.com"
► ON VIEWING OUR PORTFOLIO YOU WILL KNOW OUR EFFICIENCY. It's not possible to publish all work here. Few works are shown here. If you need to see more then, please Email us. 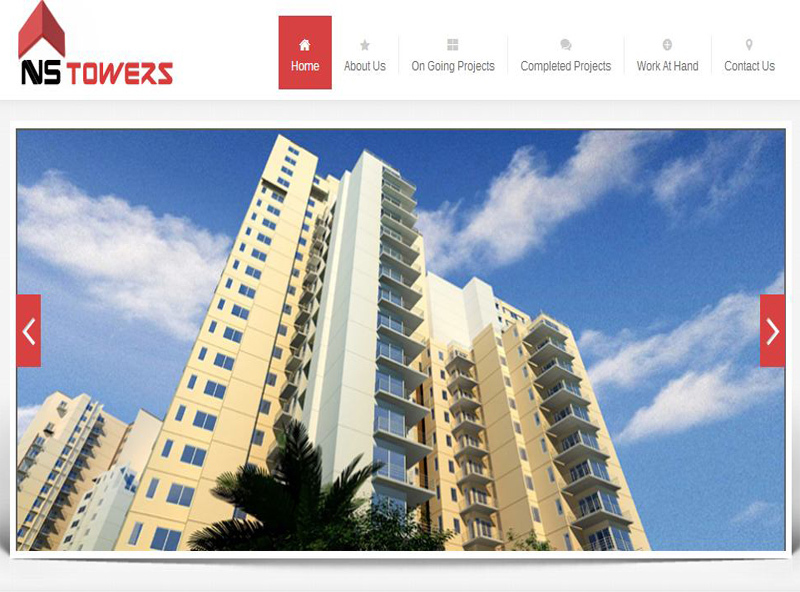 Powered by intellect and driven by values Ahinsha Projects private Limited is run by Proprietor Mr. Rahul Kothari, Mr. Abhinandan Banerjee and Mr. Arup Saha. Planning and designing the layout of apartment and offices Customizing flooring, ceiling, wall colors, lights and fittings Providing furniture of choice. 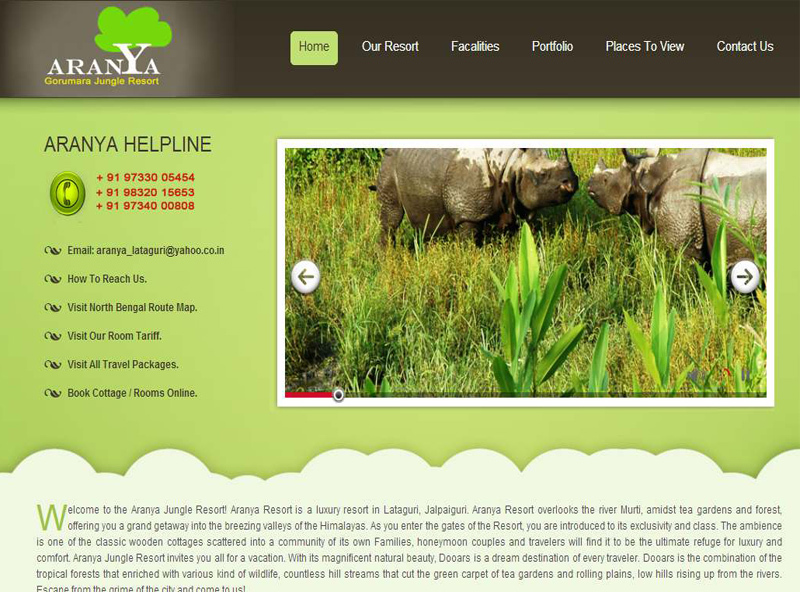 Aranya Resort is a luxury resort in Lataguri, Jalpaiguri. Aranya Resort overlooks the river Murti, amidst tea gardens and forest, offering a grand getaway to the Himalayan valleys. 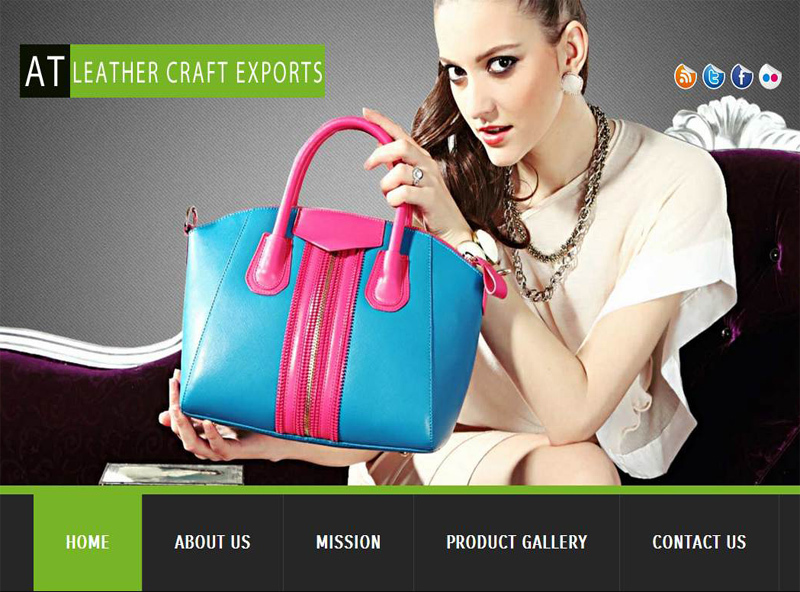 A.T.LEATHER CRAFT EXPORTS offers the most distinctive and comprehensive collection of Leather Accessories. Prodyut Kumar Sarkar is a sole proprietorship firm that was established in the year 1980 having its office at Kolkata West Bengal. 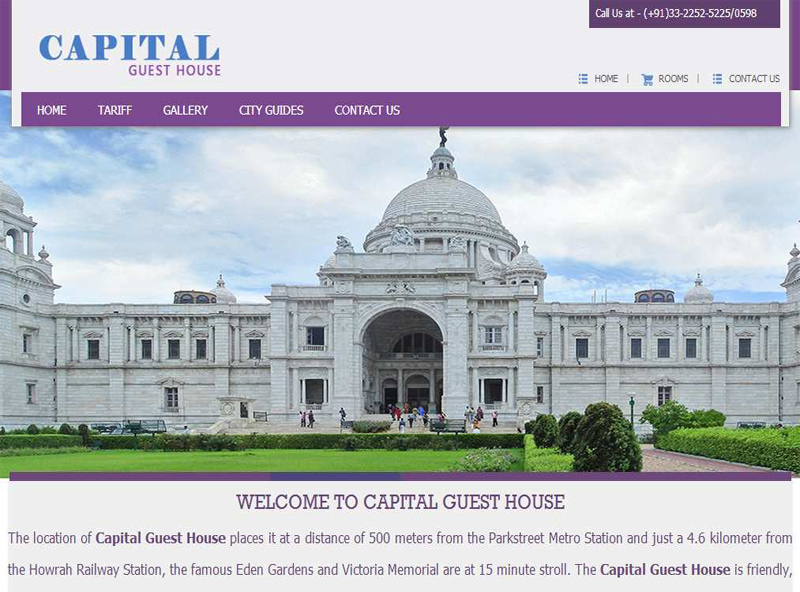 The location of Capital Guest House places is at a distance of 4.6 kilometer from the Howrah Railway Station. For entire list of portfolio, please follow This Link . If you need to see more then, please Email us. After placing order & making payment, our template gallery login details are automatically sentout in your registered email. We have wide range of templates to choose from. Aroung 800+ are available for you. 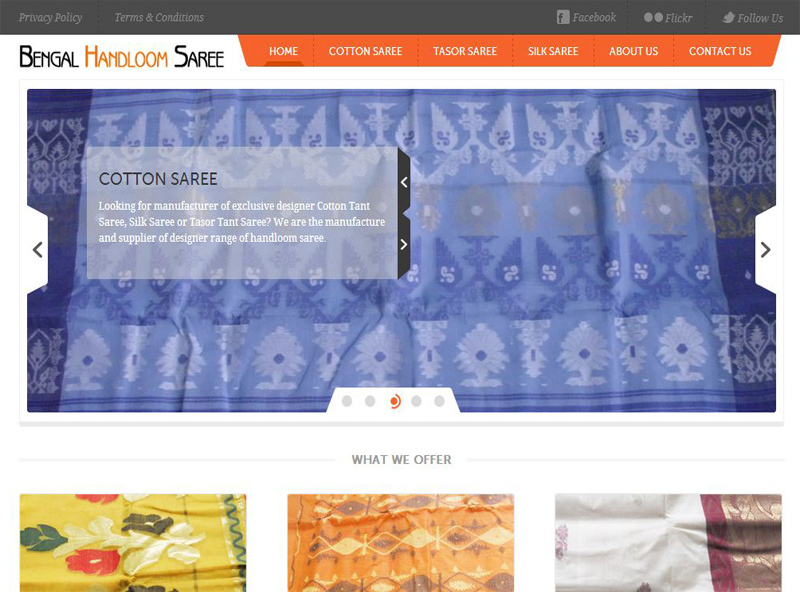 You need to select appropriate template for your upcoming website. So we are advising you to must select any one template from our template gallery and must inform us the "Template Number", so that our people can start working on your project. Outside template from our gallery will be not allowed in this package. But if you want us to create customised website based on your suggestion then you need to pay template development cost upfront. The cost for templete development can only be analysed if we have your design suggestion. You can send your customised design suggestion in the email: "care@ingeniouswebsitesolution.com"
◉ Step-1: First you will decide about pages and their menu name will have in your website. ◉ Step-2: Now fill the content details in an Word Document with the page / menu's name on the heading (If possible make separate word file for separate pages). ◉ Step-3: Go through the main template which you selected and decide which layout of the template you want us to make your inner pages (i.e. except Homepage and Contact Us Page). ◉ Step-4: Decide about the image as per your requirement and choice (if possible rename the image with your preferable placeholder. e.g.- home.jpg, about-us.jpg, etc...). ◉ Step-5: After everything gets ready copy all the files inside a particular folder, then ZIP that folder and attach us in e-mail (care@ingeniouswebsitesolution.com). If you are unable to manage content, then we shall manage your content against a very minimal rate. The rates are followings. ◉ Content Writing: For your site development, you need to provide Texts for all of your site pages. Unfortunately, If you have hard time on creating "Texts" for you your site, then on your request our expert copy writer can help you in creating content for your site pages. We will provide Standard Content writing only at INR 700/- per page for 400 words long article. ◉ Stock Images: For your site development, you need to provide "Images" for all of your site pages. Unfortunately, If you have hard time on sending "Images" for you your site, then on your request our developer can suggest "Stock Images" for your website. We provide Standard "Stock Images" only at INR 500/- per image. ◉ Logo Development: If you want us to develop logo for your website then our creative people will happy to help you out. Development of High resolution Standard Business Logo for your organization will cost INR 1500/- only. What Our Valluable Client Says! Copyright © 2009-2015 Ingenious Website Solution All Rights Reserved.